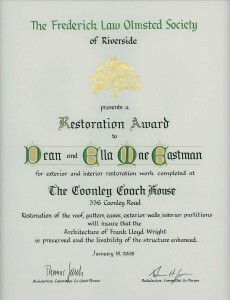 The Frederick Law Olmsted Society 2007 Architectural Restoration Award was presented to Dean and Ella Mae Eastman for their restoration of the Avery Coonley Coach House. The two year effort was an adaptive renovation and restoration of the Coach House and Sunken Garden to an attractive residence which restores or recreates the original exterior appearance and exterior and interior materials, colors and textures as much as possible. 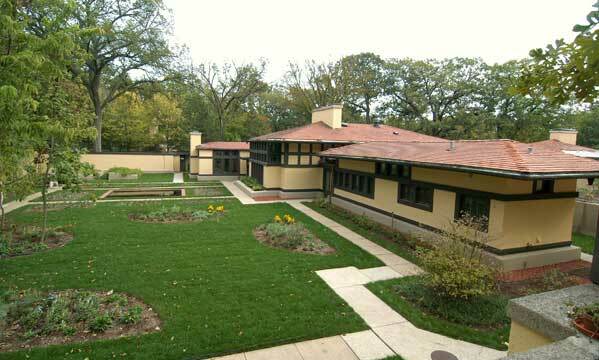 Queene Ferry Coonley and Avery Coonley commissioned Frank Lloyd Wright in 1907 to build the Coonley Estate on Block II, District 1 in Riverside, Illinois. The Coonley Estate originally included the Coonley House, the Stable, the Gardener’s Cottage and extensive gardens. After the estate was built (1907-1911), Jens Jensen designed and implemented a landscape plan for the property which utilized and incorporated Wright’s hardscape plan. 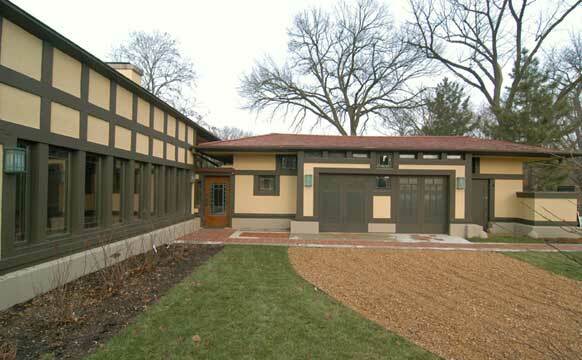 The Coonley House is widely considered on of Wright’s three most significant Prairie houses and was described by Wright as his favorite house in his 1932 Autobiography. The Coonley House with four linked units was Wright’s first zone plan. The Coonley House, Stable and Gardener’s Cottage became National Historic Landmarks in 1970. The Stable was completed in 1911 and was significantly altered by the Coonleys to contain a two car garage and a central steam boiler for the estate. The chicken coop was eliminated. The carriage garage in the main unit was enlarged and the three units were connected. These alterations were likely implemented by William Drummond. 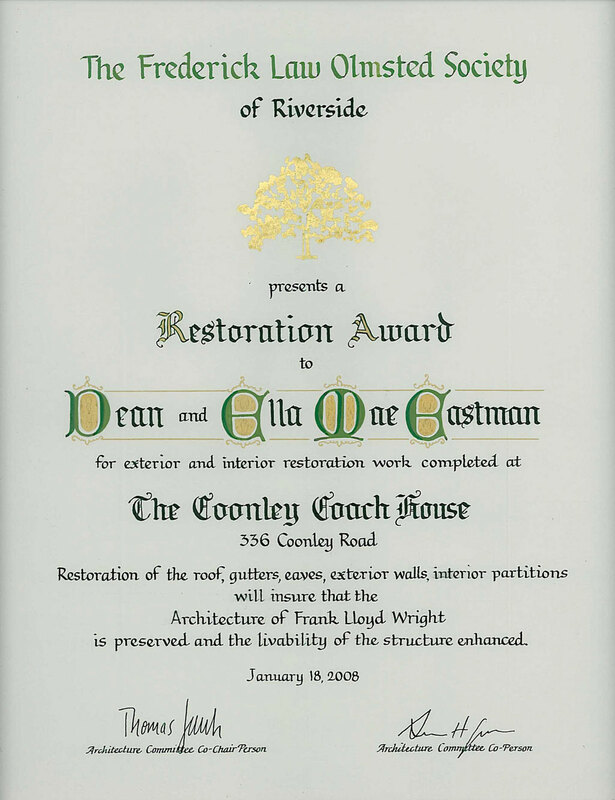 The restoration goal is an adaptive renovation and restoration of the Coach House and Sunken Garden to an attractive residence which restores or recreates the original exterior appearance and exterior and interior materials, colors and textures as much as possible. A total restoration of all elements of the house and grounds has been implemented. detailed analysis of the ‘as-is’ building (structures, materials and colors). Stabilization, repair and restoration of the damaged and leaking roof. Extensive structural framing and new soffit planks to support the Wright copper barrel gutter. Existing casement light screens were replaced and new structural framing was done for new windows and doors. Exterior walls were rebuilt as needed with repair of structural deficiencies. New stucco was added to match the original Coonley House stucco. 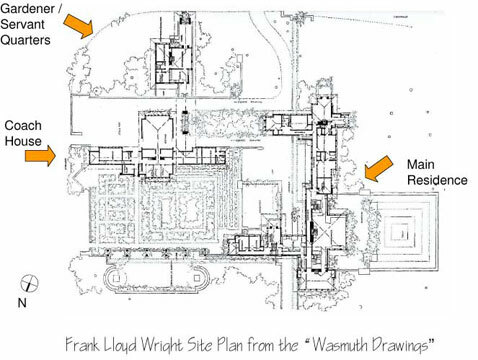 Wright’s original “Sunken Garden” plan was recovered by removal of extensive junk trees and shrubs, construction debris and incorrect patio tile and dirt. All grounds were landscaped based on Jens Jensen’s October 1913 Coonley Estate Plan. An entry hall was created where the original entry foyers for the Coonleys and their servants had been. Infrastructure improvements included new sewer lines, HVAC, zoned radiant heating, and updated electrical systems and components. About 70 existing in-place “Kyoto” art glass windows plus a dozen more found in the attic, were removed, restored and put back in place. About 18 new art glass windows recreating this design were added. Walls and ceilings were restored, including restoration and re-use of original brick materials where possible. Other new walls were plastered with a sand textured material closely resembling the original walls. White oak trim was applied throughout the house modeled on a simplified design of the Coonley House original trim. Salvaged bricks were also used in the creation of new fireplaces for the Coach House. Simple original brass sconces have been recreated and installed in many rooms. Restoration of the Coach House and its grounds enhances the status of the Coonley Estate as one of Wright’s finest efforts. Together with the main part of the Coonley House and its grounds, about 80% of the buildings and hardscape of the original estate on Block II have been restored for the future. 1910 Wasmuth Drawing for the Avery Coonley Estate, including site plan for the Sunken Gardens located west of the Coach House. A view of the newly restored ‘Carriage Garage’ (ahead) and ‘Coachman’s Apartment’ (to the left). A view overlooking the western façade of the newly restored Coach House with adjacent ‘Sunken Garden’ recreated based on template from landscape architect Jens Jensen.